Description: 478 and 1522 are part of a large lash-up of IHB and UP power. Description: Slug leads a freight east. Title: The "IHB Parade" begins in the west! 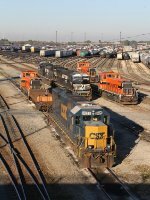 Description: Slowly rolling east along the IHB mainline in Dolton is this interesting parade of switchers and slugs. Description: Leading the "parade" is the yard slug #478 with its low slung appearance - truly appreciate the "slug" nickname for these units especially with its telescoping "eyes"! 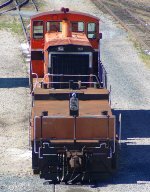 Description: Third in line is another workhorse SW1500 switcher, #1521. Title: And the "parade" continues east . . . Description: Indiana Harbor Belt 1522 semi-permanently mated with yard slug 478 head east along the IHB in Hammond, IN. The "mother & calf" have been mated since at least 1979. Description: Rebuilt from IHB 8717 wreckage, this yard slug has been paired with IHB 1522 since at least 1979 and both have received several paint schemes along the way.